When we reviewed the aluminum MacBook back in October 2008, those MacBooks posted performance scores that were very similar to the 15-inch MacBook Pro that was also released in October 2008. At that time, the differences between the MacBook and MacBook Pro boiled down to features. Now, with the new MacBook Pro lineup, the features on Apple's latest 13-inch aluminum laptops have been brought up to equal those found on the new 15-inch MacBook Pros. Unveiled at Apple’s annual Worldwide Developer’s Conference, the new 13-inch MacBook Pro has three new features that were not found in the aluminum MacBooks that have been replaced. First, the new 13-inch laptops use a longer-lasting, non-removable battery, similar to the one first unveiled in the 17-inch MacBook Pro. Second, Apple re-implemented the 13-inch’s FireWire connectivity in the form of a single backwards-compatible FireWire 800 port. Hallelujah! And finally, the new 13-inch MacBook Pros now feature a Secure Digital (SD) memory card slot. Having an internal SD card reader is obviously handy for photographers and videographers whose cameras record to the popular SD format, but that’s not its only function—it can be used as a startup disk. After using OS X’s Disk Utility to format and create a GUID partition on a 8GB card, we installed Leopard on the card and were able to use it as a startup disk. The new 13-inch MacBook Pros is available in two standard configurations. The $1,199 model has a 2.26GHz Core 2 Duo processor, 2GB of 1,066MHz DDR3 RAM, and a 160GB 5,400 rpm hard drive. 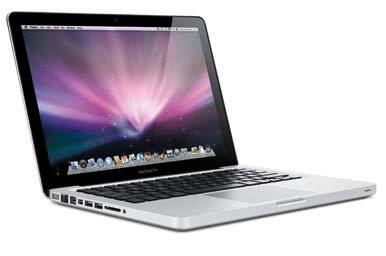 The $1,499 model features a 2.53GHz Core 2 Duo processor, 4GB of 1,066MHz DDR3 RAM, and a 250GB 5,400 rpm hard drive. Both models ship with the same Nvidia GeForce 9400M graphic chip (which was used in the aluminum unibody MacBook) that share 256MB of main memory. The new laptops look nearly identical to the aluminum MacBooks they replace. They have the same precision-crafted aluminum unibody design as the aluminum MacBook, an iSight camera, and a glossy widescreen with a 1,280 by 800 pixel resolution. Apple claims that improvements made to the display and backlight have increased the color gamut by 60 percent. Looking at a batch of photos on the new 13-inch MacBook Pro models and the older 13-inch aluminum MacBook, bright colors like reds and oranges really stand out on the new laptops, making the previous display look a little muted in comparison. Interestingly, the viewing angle seemed a little better on the older screen, though only at fairly extreme angles. In everyday use, its hard to imagine the new system’s viewing angle being a problem. Unfortunately, there isn't an anti-glare screen option for the 13-inch MacBook Pro. On the left hand side, the new 13-inch MacBook Pros have a MagSafe power connector, Gigabit Ethernet port, Mini DisplayPort, two USB 2.0 ports, and the previously mentioned FireWire 800 port (Amen!) and SD card slot. These two additions do come at the cost of separate audio in and audio out ports, which are replaced with a combined optical digital output/headphone out port that can be switched to be an analog audio line in (it works with the Apple Stereo Headset that comes with the iPhone). Also, the Kensington lock slot has moved to the right side, next to the slot loading 8x SuperDrive. We tested the two new 13-inch MacBook Pros using our overall system performance test tool, Speedmark 5. Compared to each other, the new 13-inch 2.53GHz MacBook Pro was just over 12 percent faster overall than the 13-inch 2.26GHz MacBook Pro. The 2.53GHz laptop was about 21 percent faster at Photoshop and Cinema 4D. There’s a major difference in the amount of RAM installed in the standard configurations of these two laptops; the 2.53GHz model comes with 4GB of RAM, while the 2.26GHz model has 2GB of RAM. We leveled the playing field by adding 2GBs of memory to the 2.26GHz model, bringing it up to 4GB. Most of our tests, which are run one at a time, don't benefit much from additional RAM, and the underwhelming two-point improvement in the Speedmark score bears that out. The biggest performance difference with the additional RAM was in our Photoshop suite times, which improved the 2.26GHz MacBook Pro's score by about 10 percent. When compared to the aluminum 2GHz MacBook, the new 13-inch 2.26GHz MacBook Pro is about 12 percent faster overall in our Speedmark test, as well as speed improvements across the board in our other application tests. Looking at the performance differences between the new 13-inch 2.26GHz MacBook Pro and the lowest priced Mac laptop, the $999 2.13GHz white MacBook, we find a Speedmark improvement of 7.5 percent with the 2.26GHz MacBook Pro. The 2.26GHz model also had better frame rates in 3-D games, thanks to the faster memory that the MacBook Pro uses; the white MacBook uses 800MHz DDR2 memory, while the 2.26GHz MacBook Pro uses 1,066MHz DDR3 RAM. The most interesting benchmark comparison is between the 13-inch 2.53GHz MacBook Pro and the 15-inch 2.53GHz MacBook Pro. These laptops had a less than one percent difference with their Speedmark scores; the specifications for these two laptops are nearly identical. The $200 price difference between the two buys you nothing more than an additional two inches diagonal of screen real estate. Best results in bold. For Speedmark, Quake 4, and Call of Duty 4 higher scores are better. All other tests are timed results where lower times are better. Reference systems in italics. Speedmark 5 scores are relative to those of a 1.5GHz Core Solo Mac mini, which is assigned a score of 100. Adobe Photoshop, Cinema 4D XL, iMovie, iTunes, and Finder scores are in minutes:seconds. The white MacBook and the MacBook Pros were running Mac OS X 10.5.7. The Photoshop Suite test is a set of 14 scripted tasks using a 50MB file. Photoshop’s memory was set to 70 percent and History was set to Minimum. We recorded how long it took to render a scene in Cinema 4D XL. We used Compressor to encode a 6minute:26second DV file using the DVD: Fastest Encode 120 minutes - 4:3 setting. In iMovie, we applied the Aged Film Effect from the Video FX menu to a one minute movie. We converted 45 minutes of AAC audio files to MP3 using iTunes’ High Quality setting. We used Quake’s average-frames-per-second score; we tested at a resolution of 1,024-by-768 pixels at the Maximum setting with both audio and graphics enabled. We duplicated a 1GB folder, created a Zip archive in the Finder from the two 1GB files and then Unzipped it.—Macworld Lab testing by James Galbraith, Blair Hanley Frank, Chris Holt, and Helen Williamson. You can’t swap out the new built-in lithium polymer battery, but Apple’s hoping you never need to—our tests show that the new battery lasts longer per charge than the removable battery found in the previous generation of MacBooks. In our battery life test, we play on a continuous loop a movie ripped from a DVD and saved to the internal hard drive. The movie is played at full screen and full brightness, with the keyboard illumination turned all the way down and AirPort turned off. The new 13-inch MacBooks lasted about 48 minutes longer than the older aluminum MacBook, and about 10 minutes longer than the current 2.13GHz white MacBook. If you compare the battery life of the 13-inch MacBook Pro to that of its 15-inch siblings, you’ll find that the larger batteries in the 15-inch models give the laptop 30 more minutes of playback power. The new 13-inch MacBook Pro models can handle up to 8GB of memory. To upgrade the RAM in the 2.26GHz model, which comes with just 2GB of RAM in its standard configuration, Apple charges an extra $100 for 4GB (a pair of 2GB modules) and $1,100 for 8GB (a pair of 4GB modules). The 2.53GHz model, which ships with 4GB of RAM can be purchased with the optional 8GB of memory for an additional $1,000. Third-party companies will sell you compatible memory for less; OWC, for example, sells a 8GB kit for $635, but you have to install the RAM yourself. Unfortunately, Apple won’t sell a MacBook Pro without RAM, or even let you configure a 2.53GHz laptop with less than 4GB, so if you do decide to use after-market memory, know that you’ll end up replacing the stock memory with the upgrade, and you’ll have two extra of sticks of RAM. OWC has a memory trade-in program that will help a little to offset the cost of the upgrade. Apple also offers two solid-state drive (SSD) options and charges $400 for a 128GB SSD or $850 for a 256GB SSD. Each option costs $50 less on the 2.53GHz model. Processor upgrades are not an option on the 13-inch MacBook Pros, and Apple only offers optional 7,200 rpm hard drives on the 15- and 17-inch Macbook Pro models. Apple considers the memory and hard drive as user serviceable parts, so there’s nothing stopping you from buying one from a third party and installing it yourself. With its lower price, the return of FireWire (woo-hoo! ), longer battery life, better looking display and a new built-in SD Card slot that you can boot from, the newest member of the MacBook Pro makes an impressive debut. This review was edited at 2:18 p.m. PT to correct a typographical error in the product review box regarding the speed of the hard drive upgrade option unavailable to the 13-inch MacBook Pro models. With its lower price, the return of FireWire, longer battery life, better looking display and a new built-in SD Card slot that you can boot from, the newest member of the MacBook Pro family makes an impressive debut. With its lower price, the return of FireWire, longer battery life, better looking display and a new built-in SD Card slot that you can boot from, the newest member of the MacBook Pro makes an impressive debut.